Delkatla Wildlife Sanctuary was just a piece of real estate until Sam Simpson, long-time resident of Masset and one of the true conservationists in the days when no such word existed, recognized the importance of keeping wild places, not only for wildlife and their habitat, but also for the sake of our human souls. In Januray 1958, he convinced the members of the Masset Rod and Gun Club to put their heads together and their hands in their pockets to prevent Delkatla Wildlife Sanctuary from being privatised. His idea to purchase the land took wing and the list of Masset residents who contributed reads like a “who’s who” of Masset. This purchase allowed the local members of the Masset Rod and Gun Club to continue hunting on Delkatla, however when Masset became an incorporated area, hunting gradually ceased. 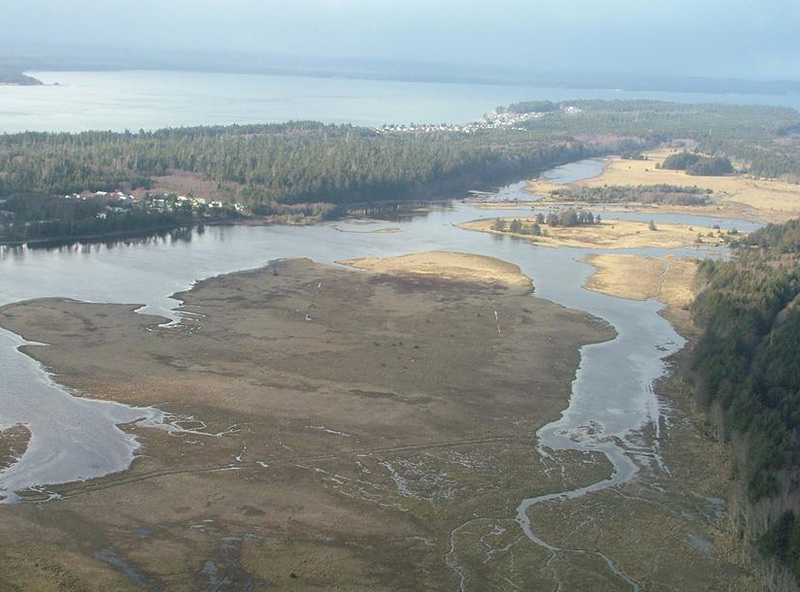 In 1969, The Masset Rod and Gun Club gave its land, conditionally, to the Village of Masset stating that the land hereby conveyed is to be used as a Wildlife Sanctuary and Park Recreational Area, provided the recreational use of the area is not detrimental to the wildlife. In 1974, the Department of National Defence gave a further portion of land for wildlife protection and the Provincial Government added a further parcel. 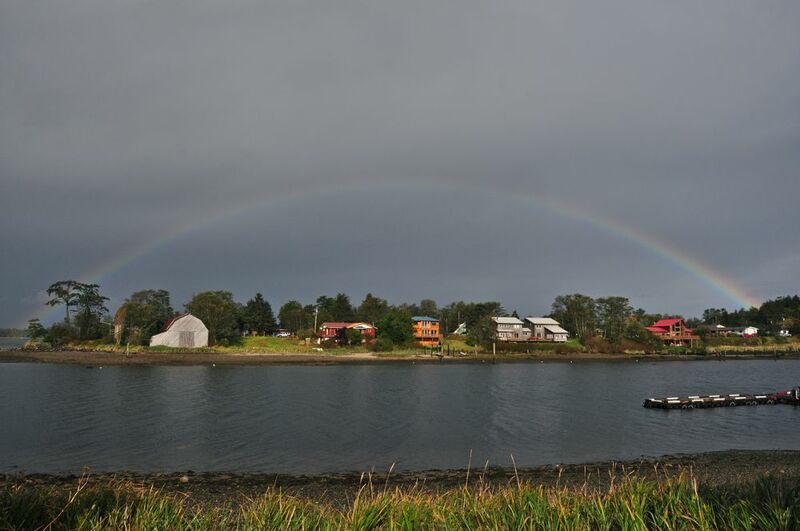 Delkatla Wildlife Sanctuary is now protected by land covenants and title deeds in perpetuity. Ronnie Stewart, who lived adjacent to the Wildlife Sanctuary in the 40’s and 50’s was an important figure. He helped persuade people not to shoot the migrant ducks and geese who landed there. He collected the first Steller’s Eider for BC in 1948. It was taken at Delkatla and the specimen now rests in the Royal BC Museum in Victoria. Other famous ornithologists who lived here include John Kerry (1890 - 1897), who founded the first sharp-tailed Sandpiper for Canada. He was the first to document the birds of the Queen Charlotte Islands and Major Allan Brooks studied the spring shorebird migration in Delkatla in 1920. In 1964, a causeway was built across the entrance to Delkatla which blocked tidal access. This altered the natural habitat. Fresh-water plants began to invade the wetlands. The causeway remained intact until February 1995 when, following a major fund raising event effort $1 million was raised, bridge was built and Delkatla was restored as tidal estuary. Individuals, foundations, government and non-government agencies all contributed to the restoration of the Delkatla Wildlife Sanctuary. In a few short years since tidal water was restored major changes have occured. Freshwater growth has disappeared from the mud flats. Spruce and alder are no longer invading and juncus effucus disappearing from the meadows. Waterfowl use has increased dramatically. In November 1997, the numbers of green-winged Teal increased to 1600 from a previous winter average of 80. Over thirty Sandhill Cranes spent the summer there in 1997 and shorebird usage is increasing yearly. Plans are underway to build a Nature Interpretive Centre opened in 2002 to increase our understanding of the human and natural history of Delkatla. Great Blue Heron, Trumpeter Swan, Canada Goose, Green-winged Teal, Mallard, Pintail, American Widgeon, Greater Scaup, Common Goldeneye, Bufflehead, Common Merganser, Bald Eagle, Sharp-shinned Hawk, Red Tailed Hawk, Peregrine Falcon, American Coot, Sandhill Crane, Black-bellied Plover, Pacific Golden Plover, Semipalmated Plover, Killdeer, Black Oystercatcher, Greater Yellowlegs, Western Sandpiper, Least Sandpiper, Dunlin, Short and Long-billed Dowitcher, Common Snipe, Mew Gull, Thayer’s Gull, Herring Gull, Glaucous-winged Gull, Northern Saw-whet Owl, Rufous Hummingbird, Belted Kingfisher, Red-breasted Sapsucker, Hairy Woodpecker, Pacific-slope Flycatcher, Tree Swallow, Barn Swallow, Steller’s Jay, Northwester Crow, Common Raven, Chestnut-backed Chikadee, Winter Wren, Golden-crowned Kinglet, Swainson’s Thruch, Hermit Thrush, American Robin, Varied Thrush, American Pipit, Cedar Waxwing, European Starling, Orange crowned Warbler, Townsend’s Warbler, Fox Sparrow, Song Sparrow, Dark-eyed Junco, Pine Grosbeak, Red Crossbill and Pine Siskin. Rare Bird Sightings: Cattle Egret, Tufted Duck, Bar-tailed Godwit, Wood Sandpiper, Smith’s Longspur and Brambling. 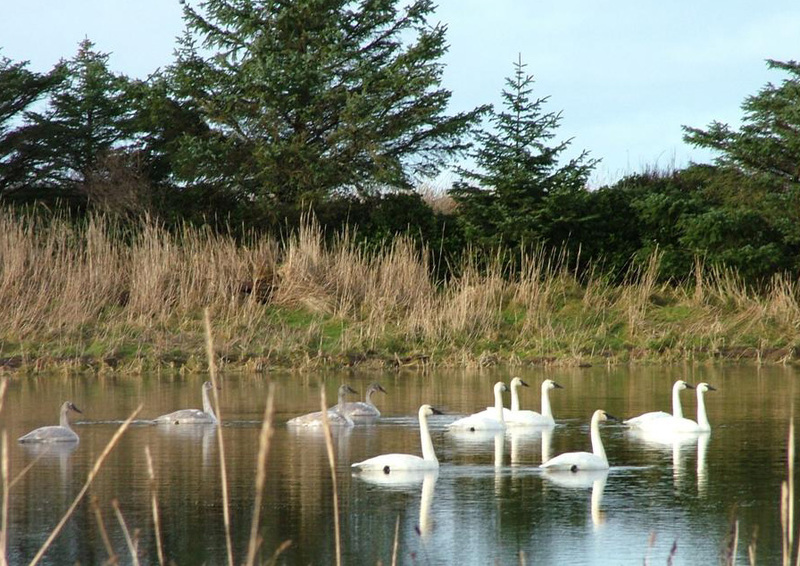 (A complete checklist of birds is available at most visitor information centres on the island.